He has been painting landscapes since he was 11. For many years he painted exclusively in watercolour concentrating on East Anglia landscapes and particularly marine scenes. He now paints with equal facility in both watercolour and oil and has greatly extended his range of subject matter. Although he has remained a figurative artist, his oils exploit the full potential of the texture of the paint and his aim remains to get a painterly image, which captures the essence of the subject. 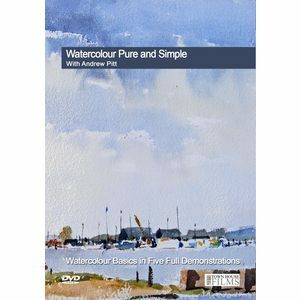 Andrew is well known for his loose, fresh approach to watercolour and the simplicity of his style has made him much in demand as a tutor in this medium. He has had 15 one-man exhibitions since 1980 and contributed to numerous mixed shows. He is a frequent art club demonstrator and workshop/painting holiday tutor. Andrew's pictures are in many private collections in Britain as well as Canada, Holland, North America, New Zealand, Slovakia and Australia.